When you put a legend like Michael Jordan on the cover of your sports videogame, it stands to reason that his inclusion in the game would amount to more than just a roster appearance on a historic team. 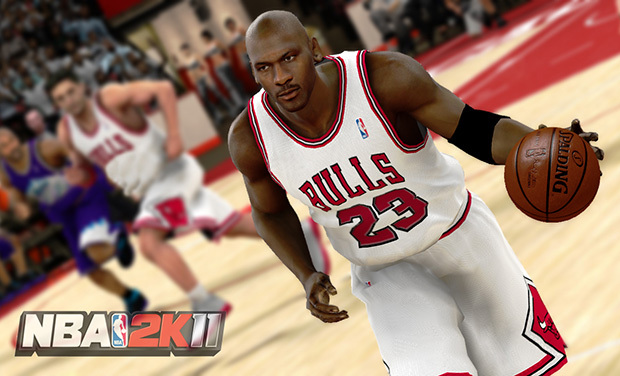 Today, 2K Sports announced a special Jordan-specific mode called "The Jordan Challenge" for NBA 2K11. It sounds similar to the "Madden Moments" feature in EA Sports' Madden series -- you'll be able to relive (and try to replicate) ten of Jordan's landmark performances. Since these moments will span most of Jordan's career, they'll involve NBA teams from the 1980s and '90s, and it's unclear at this point if the actual rosters from each of the ten games will be recreated in the game; perhaps some generic players will be utilized. (Notice how the two players in the background of the image above -- one on the Chicago Bulls, and the other on the Utah Jazz -- have no numbers on their jerseys.) Then again, the press release notes that you'll have many classic teams available, including the '85-'86, '89-'90, '90-'91, '94-'95, '95-'96, '96-'97, and '97-'98 Chicago Bulls. Hit the jump for the full list of challenges, courtesy of IGN, and check out two screenshots of Jordan in the gallery below. NBA 2K11, with Jordan and his tongue on the box, will be out on October 5th for PS3, 360, Wii, PC, PSP, PS2, and iPhone. Summary: Jordan made his mark with this 63 point playoff game against a heavily favored Celtics team. Summary: This time Jordan gets the win by dropping 69 points and putting a dent in the Cavaliers' playoff plans. Summary: Jordan and Dominique Wilkins face off in some of the all-time greatest scoring performances of the era. Summary: Jordan showed the Pistons and the world that no defensive strategy could stop him for long. Summary: Jordan silenced the doubters by coming back from a game one embarrassment to thrash the Lakers in these Finals. Summary: Just to prove a point, Jordan sets the tone for the series by dominating the first half of this first Finals game. Summary: After a stint with the bat, Jordan returns to New York to tear up the Knicks for 55 points and an unforgettable pass. Summary: Michael ran the table over the entire league but this fourth title would prove to be just as special as his first. Summary: A very ill Jordan still manages to both dominate the game and hit the winning shot in the last seconds of the game. Summary: With one final resounding shot, Jordan seals both his legacy and the fate of the Jazz's championship hopes.